Online retailer Amazon is set to leverage newly acquired Tapzo platform to develop super-app for online trade in products and services including flight ticket booking, food delivery and cab hire. Amazon India is likely to include the airline ticketing functionality to a super app that it is trying out on the Tapzo platform it acquired last year, media reports say. Amazon's proposed super app, which is in line with Tencent's We-Chat, is likely to offer an exhaustive bouquet of products and services. While Amazon is continuing with beta testing of flight bookings in collaboration with travel portal Cleartrip, the move is seen as the e-commerce giant's strategic shift to incorporate product and services sale into one umbrella app, catching a new e-commerce trend early on, according to a report in the Economic Times. "These are all third-party application integrations with market leaders in their verticals," the report cited a source as saying. Coding experts are busy developing application programming interfaces (APIs) that allow internet companies to interact with each other, allowing seamless data exchange among platforms. Amazon may be following the example of Paytm and Phonepe, the path that Flipkart and Ola are likely to take, to use their user base to provide goods and services across the board. They could include retail sales to recharge services of mobile phones and DTH as well as flight ticketing and grocery delivery and cab hire. Amazon's customer base is an estimated 150 million with the monthly unique customers estimated at 20-25 million each for Amazon and Flipkart. Sequoia Capital-backed Tapzo that Amazon acquired last year aggregates into a single app the app-based services of Uber, Ola, food delivery services Swiggy and Zomato, BookMyShow, bill payment service BillDesk and more. Amazon already have recharge and bill payments on its app. "E-commerce is no longer just about selling goods," the report quoted Neil Shah, research director at Counterpoint Research, as saying. "A growing set of users are consuming services, so while Amazon knows what goods they buy, the company does not know how they consume offline-to-online services. This move will pave the way for Amazon to get access to this data." Amazon Pay will serve as the backbone for the payment window for the functionalities that the company plans to introduce, according to an unidentified source in Amazon. The partners that Amazon Pay has struck deals with include Yatra, RedBus and Abhibus in travel; and Faasos, Box8, FreshMenu and Cafe Coffee Day in the food and beverages space, the report says. Haptik, BookMyShow and Niki.ai also accept Amazon Pay as an online payment window. 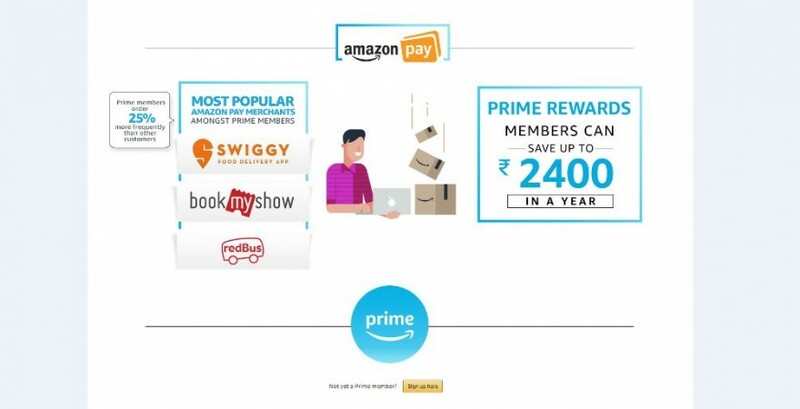 Amazon promotes these brands on the Amazon Pay landing page on its app and website along with its promotional offers for using the payment channel.